A reluctant hero. A super-powered terrorist. Will Marcus Cain find the courage to fight before it’s too late? Every Patriot Day, Marcus Cain is haunted by memories of cowardice. When the terrorists attacked on 9/11, his fellow soldiers ran to help while he took cover to save himself. Years later at a memorial bike ride, a mysterious plane crash nearby gives DC a second chance. As Marcus rushes to find survivors, he learns the aircraft was part of a top-secret government program. When a chemical blast kills Marcus’ friends and gives him supernatural powers, he’s given a new mission: deliver critical information to the pilot’s teenaged daughter. The only thing standing in his way is a former military asset with his own powers and a deadly terrorist agenda. 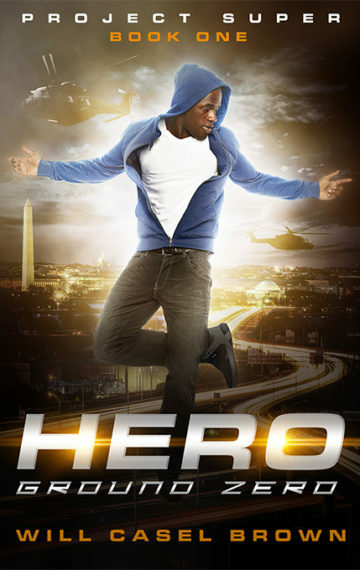 Hero Ground Zero is a superhero novel for the modern day. If you like character-driven stories, heart-pounding action, and earth-shattering superpowers, then you’ll love Will Casel Brown’s heroic debut novel. Join the mailing list to get notified of the release!